“Tell me this doctor. Can joy be a cause a of high blood pressure?” After a year of experiencing homelessness, today Neighborhood Health patient Harry Flood has been accepted as a resident at the Salvation Army in Nashville, TN. Nasteha consults with her clinical supervisor about how to relate and overcome the taboo of mental illness among the Somali culture in order to provide the best care for a Somali patient experiencing Schizophrenia. “We have to reduce the difference between the healthcare provider and the patient. Provide a space where they will feel no one is judging them.” -Dr. Roli Dived MD (left), Clinical Director, Community University Health Care Center in Minneapolis, Minn. July 24, 2018. “Our health care is fragmented as it is. You cant treat the mind and the body separately. They’re inseparable. To have colleagues from different fields working together to treat the patient as a hole is incredible.” -Nasteha Mohamed, Psychiatric Care Coordinator, Community University Health Care Center in Minneapolis, Minn. July 24, 2018. “I like to help people number one. That’s why I got into this profession. I get to be with people all day, and just so happen to measure their blood pressure too.” Sarah Boswell PharmD, Cherokee Health, Knoxville, TN. July 11, 2018. Community Health Clinic, Minneapolis, MN. “I want to bridge the gap between my (Samalis) community and the bigger (medical) community.” -Hassan Saleh, Community Health Worker, Community University Health Care Center in Minneapolis, Minn. July 24, 2018. “I feel like we’re making a huge difference here. 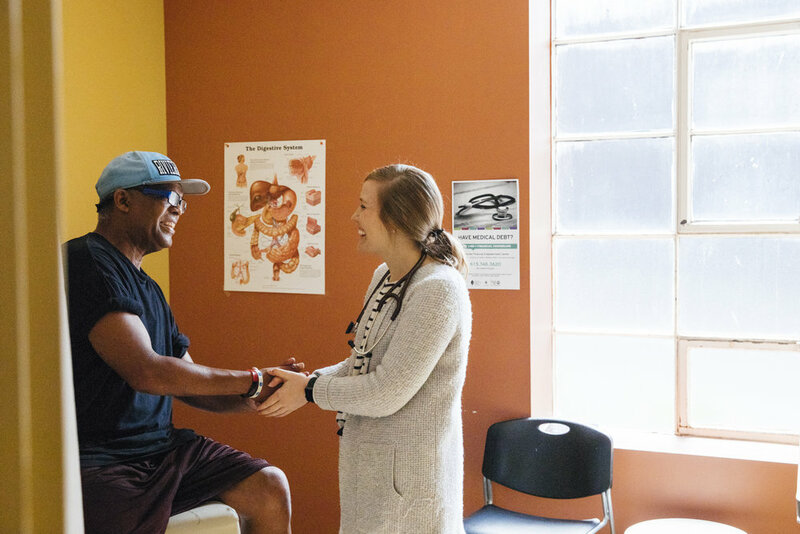 I feel like (this clinic) is playing a key role in tackling the issue of homelessness.” -Holly Cline AGPCNP-BC Nurse Practitioner at Neighborhood Health in Nashville, TN. July 13, 2018. “It’s such a gift to be able to come here everyday and physically lay hands on people and assure them that they’re important, and that they have worth and value. It is something that given back to me too.” Sarah Schaefer MD is a physician at Neighborhood Health in Nashville, TN that provides care for the underserved individuals and people experiencing homelessness. Sarah spends three days of the week working at high end metropolitan hospital. The other two are spent at the Neighborhood Clinic serving people experiencing poverty, homelessness, and persistent severe mental illnesses. Lisa Tackett PharmD, a clinical pharmacist at Neighborhood Health in Nashville Tennessee, conducts a consultation with a patient. A award from BD and Direct Relief has made it possible for Lisa to transition from a traditional retail pharmacists role into a patient interfacing role as clinical pharmacist.